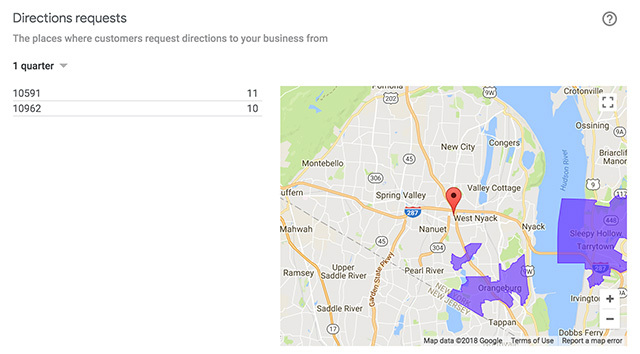 Google My Business has updated the directions heatmaps, which they originally launched in 2014 to make them more useful. Allyson Wright, Community Manager of Google My Business, announced it in the Google My Business forums saying "we've made some changes to your directions heatmap, that are rolling out this week." "This update will better allow you to track which areas customers request all forms of directions from, at various zoom levels (post code, city, country)," she added. In addition, direction requests from some post codes may appear as blank due to user privacy consideration but are included at the city level, she added. Why? Maybe due to GDPR? I am not sure. You can access yours in the Google My Business dashboard and by clicking on insights. On the map, you can zoom in and out on the map using the + and - icons on the bottom-right corner. Forum discussion at Google My Business Help & Twitter.